In 1861, like so many other American men, David Brainard Griffen took leave of his family and enlisted in the army, volunteering as a soldier for the Union. Also like so many other American men, he hoped he’d be home in a few months, that this Civil War would soon be over, and he’d be reunited with his wife, Minerva, his daughters, Alice, seven-years-old, Ida May, five-years-old, and his infant son, Edgar Lincoln. To minimize the pain of separation from his family, he wrote them letters from the field of battle, more than 100 accounts of what he was doing and witnessing as a 2nd Minnesota Volunteer. While the book is one of historic fiction, the letters are genuine, and the characters are based on actual people. The author of this fine account, Nick K. Adams, is the great-great-grandson of Corporal David Brainard Griffen. As compelling as the Corporal’s letters are, the mainstay of this book is about those left behind on the Minnesota prairie. In the introduction, Adams notes, “I invite you, dear reader, into the lives of this family who represent the high personal cost that waging war – for whatever cause, good or evil, inevitably produces.” In this manner, the reader spends time with a family doing the best it can while the head of the household is away. One feels like an invisible member of the clan while watching Minerva and her children go about their ordinary, but in many ways, extraordinary lives. Their days are made up of chores. They care for chickens and livestock, barter eggs in the nearby town of Alba for fruit, shoes, and fabric. They make candles out of beeswax and tallow and plant crops to harvest. Livestock are slaughtered. Minerva teaches her daughters to make cheese, a skill she learned during her girlhood in Vermont. They visit with family members who live in the area, enjoy spring and summer days and bundle warmly for the frigid Minnesota winters. Alice attends school and, eventually, Ida May does as well. Edgar Lincoln graduates from baby clothes to his first set of overalls. It’s the minutiae of life, the everyday details that build and hold this family, and every family, together. But the reminder of the Civil War is always there. Alice uses a game of checkers to explain warfare to her little sister, and the family gathers to read and reread letters from a husband and a father they miss dearly. They write to him, as well, letting him know how they are coping in his absence. And, of course, there is the added tension of not knowing how long the war will last and whether Brainard will be among the fortunate men to make it home. Like the best young adult novels, this book draws a universal audience. Every reader will feel enriched reading this vivid, charming, and poignant account of farm life in the mid-19th century amidst the backdrop of the Civil War. In addition to an account of family life, one learns much about practical matters in a rural, historic setting. Teachers who use Laura Ingalls Wilder’s books in their curriculums will want to add Away at War: A Civil War Story of the Family Left Behind to their lesson plans. There’s a connection between the authors; Alice Griffen married Laura Ingalls Wilder’s cousin. For those interested in simply reading Brainard Griffen’s letters, Adams published them as a collection in an earlier work, My Dear Wife and Children: Civil War Letters from a 2nd Minnesota Volunteer. Put in the context in this lovely novel, however, the letters are a reminder of what was happening in these lives when pen wasn’t put to paper, when a mother and her children had to do whatever was necessary to get through the day and rest for the coming one. This book is both simple and profound, a reminder of a time and place during a tumultuous time in American history. 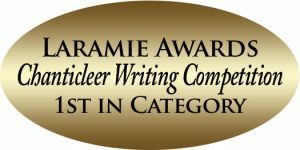 Away at War: A Civil War Story of the Family Left Behind won 1st Place in the 2017 CIBA competitions for unique stories of the United States, the Laramie Awards. 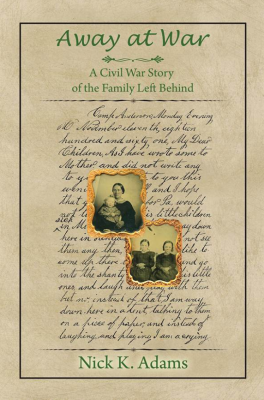 My Dear Wife and Children: Civil War Letters from a 2nd Minnesota Volunteer won Mr. Adams 1st Place in the 2016 CIBA competitions for Memoir, the Journey Awards.